GreenPak Cooperative Society has once again registered a surplus of over €130,000 in funds generated by its activities during 2013. These funds are being distributed to its cooperative society members confirming that good governance together with the pledge that GreenPak will operate at the least possible cost in the interest of the environment are the benchmarks with which GreenPak operates. This was announced during its annual general meeting. Operating across Malta and Gozo, GreenPak Coop manages the collection of packaging waste and organises its recycling. The Coop receives its funds from companies whose trade contributes towards the generation of packaging waste. Any remaining surplus in funds is at the end of each year given back as ‘Patronage Refund’ to the very companies that finance the operations of GreenPak and are members of the society. The amount of refund is worked out proportionally according to the amount of money paid by a company into the cooperative. “We welcome other companies or individuals that consider teaming up with GreenPak. No matter the size of their business, the cooperative’s statute ensures that equal representation is given in all important decisions,” added Ing Schembri. 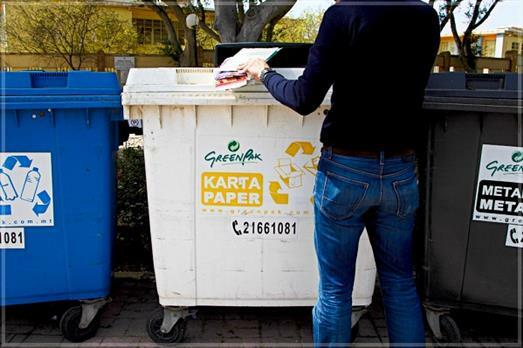 GreenPak, a MEPA authorised scheme, is the largest waste recovery scheme in Malta, with over 1,300 companies, while 38 Local Councils have entrusted GreenPak with the waste management of their locality. The organisation is a founding member of EXPRA, a not-for-profit international organisation promoting the concept that it is industry itself that should take up recycling and let recycling be a burden on Government or Local Authorities. GreenPak has for the past decade been one of 35 national producer responsibility systems operating under the PRO Europe umbrella. During the AGM the 2014 Business Plan was approved. The committee consists of Mr Martin Borg, Mr Dennis Zammit Cutajar, Mr Edward von Brockdorff, Mr Andrew Cutugno, Mr Pierre Fava, and Mr Victor Galea. GreenPak CEO is Ing Mario Schembri.